This statement from our guide seemed like the best idea, given the limited options available to us now. We’d been driving through the sandstorm for the last 15 minutes, and now we had no idea of which direction we were going in. Rather than drive further in the wrong direction, we decided to stop in the hope it would clear enough for us to get our bearings. The sandstorm had engulfed us quicker than expected, and we were sitting ducks out in the Sahara. It was one of those situations where a million things run through your head at once. For the first few minutes, we sat there and took some photos and video of the sandstorm, talking and joking. To begin with, it was a fascinating and exciting experience, we never would have thought that we would experience something like this! We were also glad to be inside a jeep, and not on top of a camel which had been the original plan. But after a few minutes, the exhilaration and adrenaline gave way to something else. Excitement became tension, tension became low level panic in our heads. The questions began streaming into our heads. How long will this last? Will we be stuck here overnight? Will we be warm enough? Will someone try and find us? 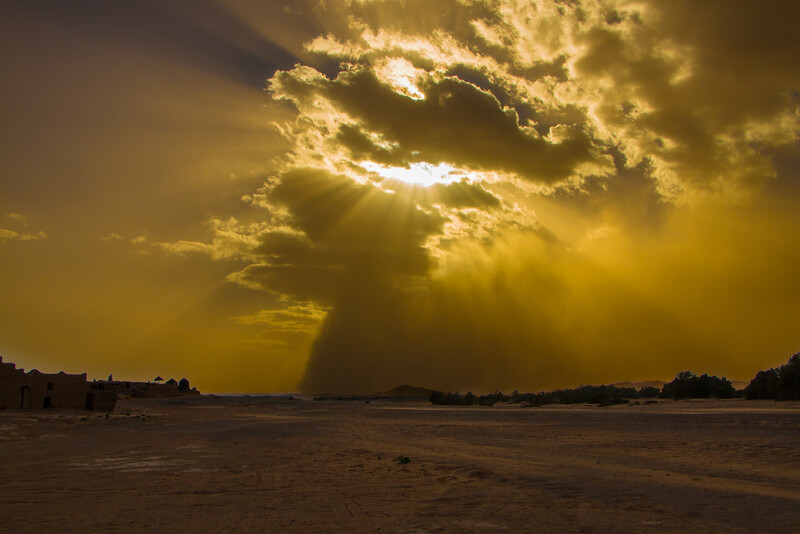 What if the sandstorm doesn’t calm before sunset? How are we meant to find our way back in the dark? As we sat quietly as the winds battered our jeep, and the sand poured in through the gaps in the window, we assessed our options. It had all started so innocently. We’d taken a 4×4 from our camp, and went off in search of the nomad tribes that live and move within the sand dunes of the Sahara. 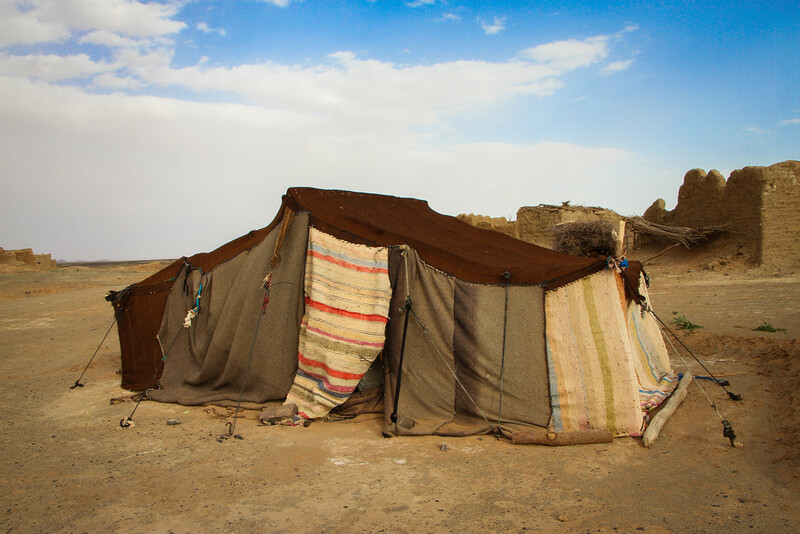 We’d found some, and spent some time wandering through the various tent settlements they lived in. As we met and talked with the nomads, a foreboding sight was bearing down on us in the distance. Our berber guide wasn’t concerned, and neither should we apparently. We continued on our exploration, but after another half an hour, the skies grew dark and orange, and the wind whipped up around us. It was at this point that we decided to head back to camp, but we were too late. 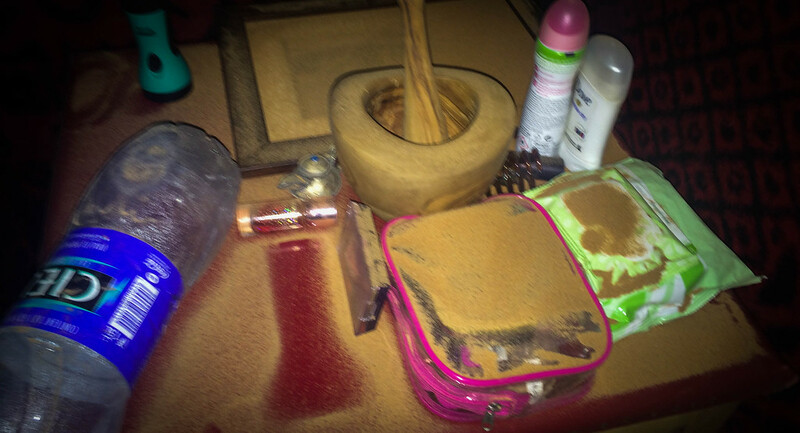 The sandstorm had hit us, and we were slap bang in the middle of it. We drove for a few minutes until we could barely see a metre in front of us. Even the sun, our main reference to keep ourselves orientated, was blocked out completely. 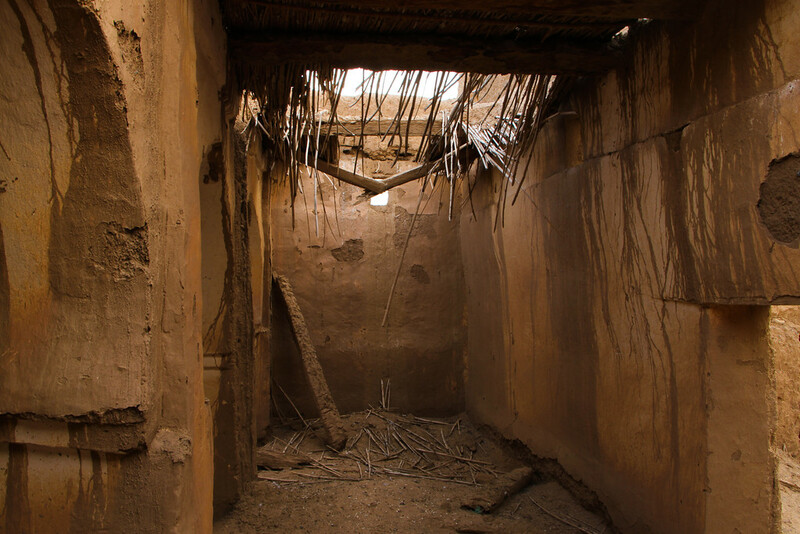 Sand poured into our jeep, through the gaps and slots in the doors and windows, and we wrapped our scarves around our faces. It was decided we would try and wait it out. A lot of things go through your mind when faced with danger, and although it may sound melodramatic now, at the time it really was a scary situation. As we sat there for that half an hour, we half heartedly made conversation in the jeep, all the while quietly considering and calculating our options. Even if we could make it back to the nomads, at least there would be some respite there. 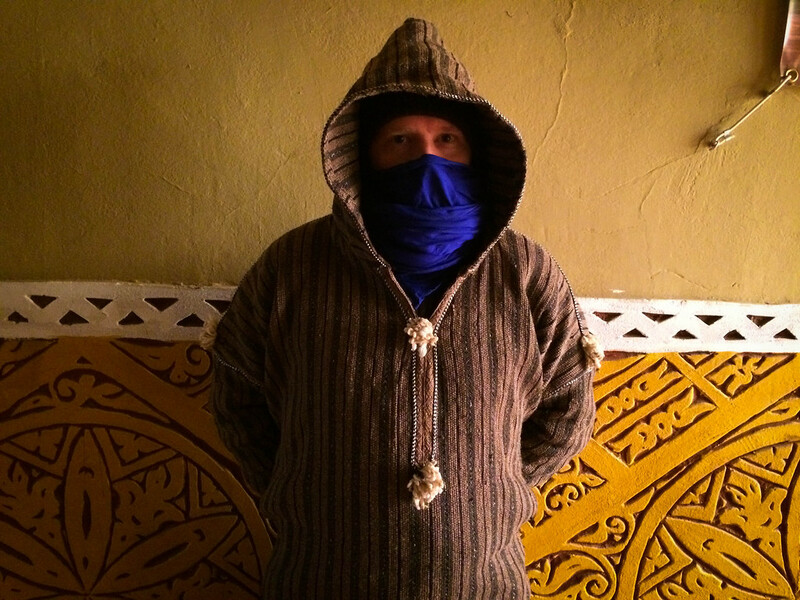 And then, all of a sudden, our berber guide sprung into life. What must have only been a few seconds gap in the wind and sand, and he’d spotted something. A mixture of catching a glimpse of where the sun was, and some tracks in the sand, he quickly became animated. We spun the jeep around 180 degrees and we plundered off back into the sandstorm, the visibility decreasing back to almost nothing again. 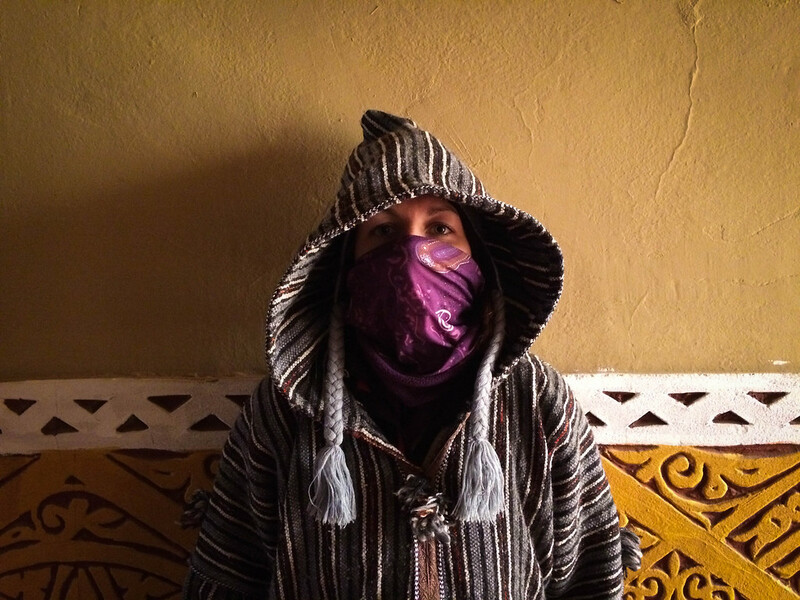 But we pushed on, trusting our berber guide to get us back to where we needed to be. To us, it all looked the same; dark orange skies, and the same sand patterns repeated over and over again. The noise of the wind was relentless, and we drove for 10 minutes through almost total blindness as our guide made small alterations to our route. And then, suddenly, a shadow ahead of us! Something breaking up the monotony of the sandstorm. It was a tent! And then a small building! We had made it back to the nomads whom we had visited earlier! They were (of course) completely surrounded by the sandstorm, but this is what it looked liked in more peaceful times earlier in the day. The relief was immense, and we knew we were now only 10 minutes from our camp. It was decision time though, do we make a run for the camp or do we wait it out with the nomads. Our guide was confident, we could be back at the camp in 10 minutes. So we pushed on, across the wide expanse of sand we had crossed at the beginning of the day. We swung right, then left, and then we stopped again. Our hearts were racing. Had we made the wrong decision to leave the nomads behind and head for camp? We were close to camp now, no doubt about it, but we didn’t want to overshoot it and become lost again. We sat again for a few minutes, our berber guide winding down his window to catch a glimpse of something, anything to orientate ourselves. The sand poured in more relentlessly than ever. Laura and I sat in silence and waited for something, anything! And then, in the distance, the outline of a small bush. Irrelevant to us, but hugely important to our guide. We drove towards it, swung right and he told us to look for another bush on the left in about 50 metres. Find that and we were home! Our jeep crawled through the sandstorm, time slowing as we held our collective breath for another bush! Never had the anticipation for spotting a bush been greater. And then it appeared! A wave of relief came over us as we drove round the bush, between two dunes and swiftly back into our camp! We had made it! We were ecstatic. We jumped out of the jeep, scarves wrapped around our heads and bolted for our tent, there was no time for pleasantries or thanks when we arrived. Relieved to be back, it didn’t matter that everything was covered in sand inside the tent! We were back and safe. As we sat on the edge of our bed and surveyed the scene, we reflected on the events of the day. How close had we come to being in real danger? How many other ways could that scenario have played out? We were shook up, no doubt about it. But despite all this, after sunset I still clambered up a dune to take a snap of the sandstorm in the distance. It was an eerie and powerful sight, something we never thought we would witness. It was nature at its most awesome. That evening, as the wind and sand howled around us, we reflected on why we travel and do the things we do. What makes us leave the comfort of our home and see the world? The short answer is, it depends on what you want from life. We live to see the world, to experience new and exciting things. And if that means putting ourselves in situations that are riskier than staying at home, then so be it. If that’s the price we pay for living the life we want, then we shall take that risk. “A ship is safe in its harbour, but it is not what a ship is built for.” We also get to dress like this, but that’s just an added bonus! For whatever reason, we were built to get out and see as much of the world as we can, and despite some scary moments, we wouldn’t change a thing about it. As we sat on the edge of our bed, and the wind and sand whirled around our tent, we kept coming back to the same moment from earlier in the day. 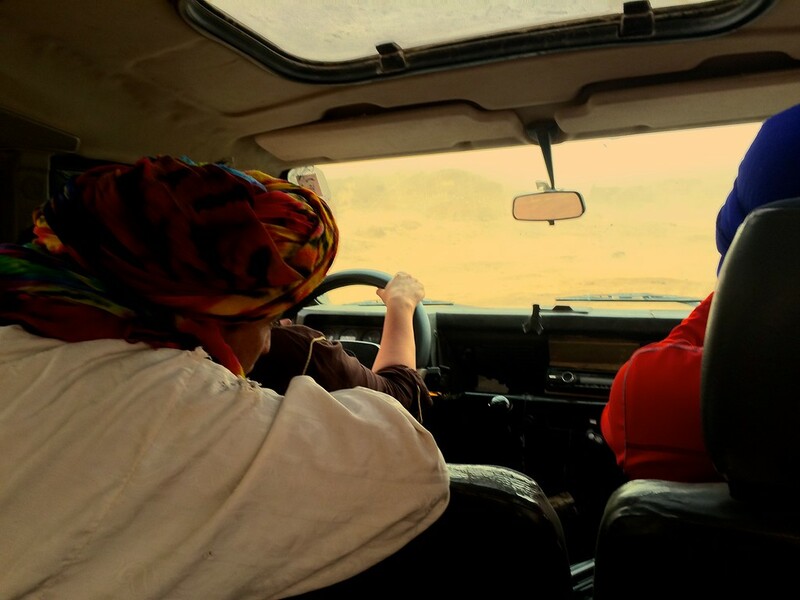 Every now and again, as we sat in the jeep, the silence would be punctured by our berber guide. With a wry grin and glint in his eye, he summed up the day without even realising. “Sa..ha..ra” he would say, over and over again. As in, you came to the Sahara, what did you expect? Rainbows and unicorns? Have you had an experience whilst travelling that made you reflect on why you do it? Let us know in the comments below! I love reading about the experiences THAT you guys have been blessed enough to see throughout the course of your travelling so far. I’m 20-coming-21, this December – one of my biggest plans, personally, is to start travelLing in 2016. Is there any general advice you could offer me at all, regardless of what advice it may be. Hi Lewis! Thanks for your comment and congratulations on your upcoming travel plans! Our advice is pretty simple, be sensible, have a rough plan but be willing to change that plan as some of the best experiences are the spontaneuous ones! Also, take it slowly and dont try to cram too much into your travels!